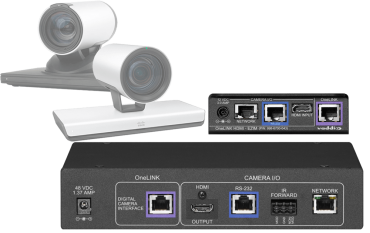 Brings your Vaddio HDBaseT camera and non-USB audio components into your USB conferencing environment for traditional videoconferencing quality, without the traditional price tag. Extends power, video and control to your camera over a single Cat-5e cable up to 328 ft. (100 m). 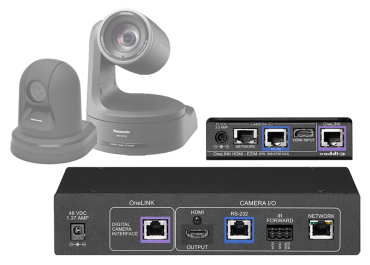 Brings your RoboSHOT HDMI camera and non-USB audio components into your USB conferencing environment for traditional videoconferencing quality – without the traditional price tag. Extends power, video and control to your camera over a single Cat-5e cable up to 328 ft. (100 m). Extends power, HDMI video and control to your Vaddio HDBaseT camera over a single Cat-5e cable. Universal CCU Quick-Connect delivers high-quality HD video, power and control over three Cat. 5 cables up to 500 feet. 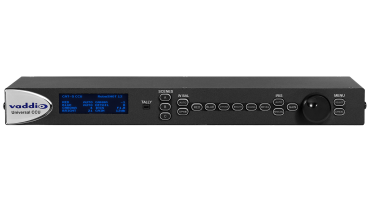 Outputs include analog component YPbPr, HDMI and HD-SDI for extreme flexibility in system design and integration. 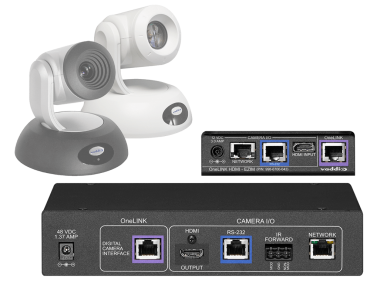 Quick-Connect DVI-D/HDMI - Short Range Interface for the Vaddio ClearVIEW HD-18, HD-19, HD-20, HD-20se and PowerVIEW HD-22, HD-30 (cameras not included). Quick-Connect USB Interface for video, power and control over Cat-5 up to 150’ (45.72m). 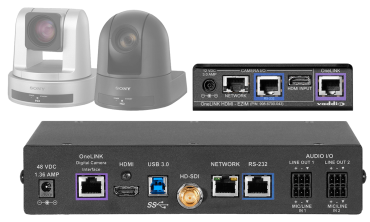 Features HD video outputs and USB 2.0 Streaming and Ethernet Streaming. 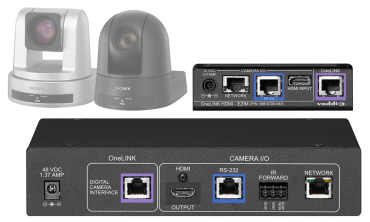 The Quick-Connect Mini System delivers high-quality HD video, power and control over two Cat. 5 cables up to 100' and includes a USB 2.0 output based on UVC standards. Replacement Quick-Connect CCU slot card for Vaddio CCU systems. Brings your traditional videoconferencing equipment – or just your Cisco camera – into a USB cloud conferencing environment for the best of both worlds. Extends power, video and control to your camera over a single Cat-5e cable up to 328 ft. (100 m). Packaged for Cisco SX20, SX80 or C-Series codecs; compatible with most Cisco Precision series cameras. 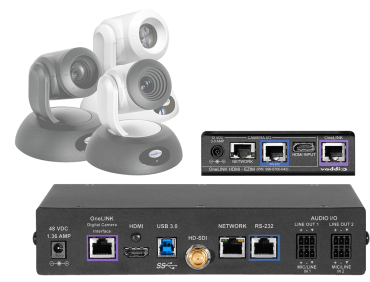 Extends power, HDMI video and control to your Cisco camera over a single Cat-5e cable. Packaged for Cisco SX20, SX80 or C-Series codecs and compatible with most Cisco Precision series cameras. 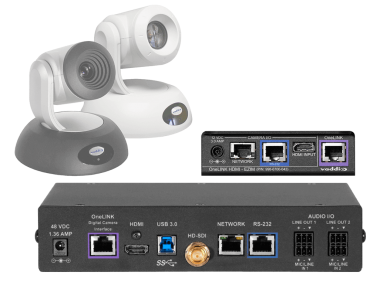 Brings your Vaddio HDBaseT camera and non-USB audio components into your USB conferencing environment and enables you to pair them with a Cisco codec for traditional videoconferencing quality. Extends power, video and control to your camera over a single Cat-5e cable up to 328 ft. (100 m). Brings your RoboSHOT HDMI camera and non-USB audio components into your USB conferencing environment and enables you to pair them with a Cisco codec for traditional videoconferencing quality. Extends power, video and control to your camera over a single Cat-5e cable up to 328 ft. (100 m). Packaged for Cisco SX20, SX80 or C-Series codecs; compatible with RoboSHOT 12 and 30 HDMI. Extends power, video and control to your RoboSHOT HDMI camera over a single Cat-5e cable. Packaged for Cisco SX20, SX80 or C-Series codecs; compatible with RoboSHOT 12 HDMI and RoboSHOT 30 HDMI cameras. Brings your traditional videoconferencing equipment – or just your Polycom camera – into a USB conferencing environment for the best of both worlds. Extends power, video and control to your camera over a single Cat-5e cable up to 328 ft. (100 m). Extends power, video and control to your Polycom EagleEye IV camera over a single Cat-5e cable. Packaged for Polycom 300, 310, 500 or 700 codecs; compatible with Polycom EagleEye IV camera. 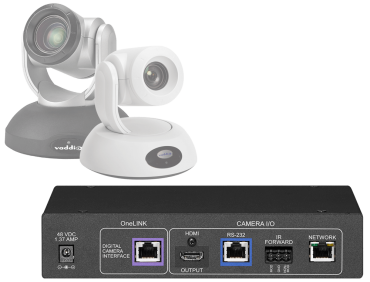 Brings your Vaddio HDBaseT camera and non-USB audio components into your USB conferencing environment and enables you to pair them with a Polycom codec for traditional videoconferencing quality. Extends power, video and control to your camera over a single Cat-5e cable up to 328 ft. (100 m). Extends power, video and control to your Vaddio HDBaseT camera over a single Cat-5e cable. 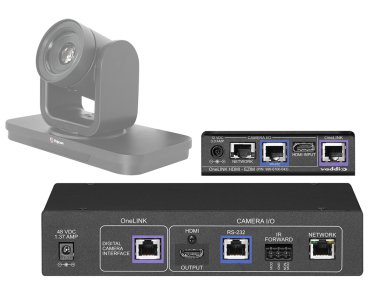 Brings your RoboSHOT HDMI camera and non-USB audio components into your USB conferencing environment and enables you to pair them with a Polycom codec for traditional videoconferencing quality. Extends power, video and control to your camera over a single Cat-5e cable up to 328 ft. (100 m). Packaged for Polycom 300, 310, 500 or 700 codecs; compatible with RoboSHOT 12 HDMI and RoboSHOT 30 HDMI cameras. Brings your non-USB camera and non-USB audio components into your USB conferencing environment for traditional videoconferencing quality, without the traditional price tag. Extends power, video and control to your Sony camera over a single Cat-5e cable up to 328 ft. (100 m). 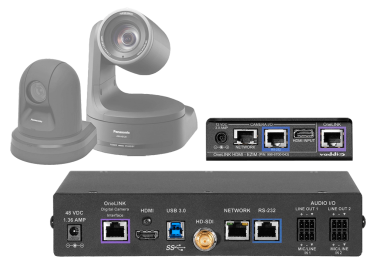 Brings your non-USB camera and non-USB audio components into your USB conferencing environment for traditional videoconferencing quality, without the traditional price tag. Extends power, video and control to your camera over a single Cat-5e cable up to 328 ft. (100 m). Packaged for Panasonic HE series cameras. Extends power, video and control to your Panasonic camera over a single Cat-5e cable. Compatible with Panasonic HE series cameras.